Nelson Mandela, the South Africa’s first black president, has been rushed to hospital with abdominal complaint. According to officials, Nelson Mandela was suffering from a “long-standing abdominal complaint” which doctors felt needed “proper specialist medical attention”. A spokesman for current President Jacob Zuma said Nelson Mandela, affectionately known as Madiba, was “in good spirits and well”. The 93-year-old statesman and anti-apartheid icon has suffered declining health in recent years. President Jacob Zuma’s office said the “love and good wishes of all South Africans and people throughout the world” were with him. In a statement, Jacob Zuma asked for Nelson Mandela and his family to be given privacy. The statement did not say which hospital he had been admitted to but there are suggestions it was a military hospital in the capital, Pretoria. Nelson Mandela returned to Johannesburg last month from his rural home in the Eastern Cape and in January last year, he received treatment in the city’s Milpark hospital for a serious chest infection. “I can assure you that the former president is in good spirits and well,” said presidential spokesman Mac Maharaj. He said further information would be released once President Jacob Zuma and the Mandela family had received a full medical report from doctors, but that the 93-year-old’s life was not in danger. “This was a long-standing complaint – nothing that cropped up suddenly and needed emergency attention,” said Mac Maharaj. Mac Maharaj would not confirm reports that Nelson Mandela had undergone surgery for a hernia overnight, and appealed for “co-operation from the public and the media so we manage this thing properly”. The South African government is clearly keen to control the flow of information, after previous alerts about the former leader’s health have been the subject of much speculation. Nelson Mandela retired from public life eight years ago – his last public appearance was at the World Cup in South Africa in 2010. Nelson Mandela spent 27 years in prison for his actions against the apartheid regime before being released in 1990. 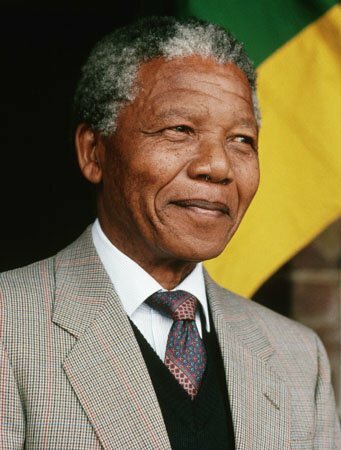 In 1994, Nelson Mandela became South Africa’s first black president, stepping down in 1999 after one term.